The striking progress in genome science and gene technology has led to numerous discoveries and the development of new technologies in the life sciences, leading to the establishment of major trends. These new technologies include live imaging, in which specific protein molecules are visualized in live cells by means of genetic engineering. To date, there have been various technologies for visualizing protein molecules. However, the visualization inside live cells using gene technology constitutes landmark new technology. Aside from having a major impact on the life sciences, it continues to elicit new aspects in kind. In 1992, Dr. Douglas Prasher et al. reported the cloning of the green fluorescent protein (GFP) from the jellyfish Aequorea victoria. Then, in 1994, the group successfully introduced the GFP gene into live cells to demonstrate the expression of protein molecules that emit green fluorescence, which revealed that it could become a good marker for gene expression. In this way, it became possible to observe in real time the behavior of specific protein molecules in live cells. At present, extremely high licensing and contract fees are paid for this GFP technology. 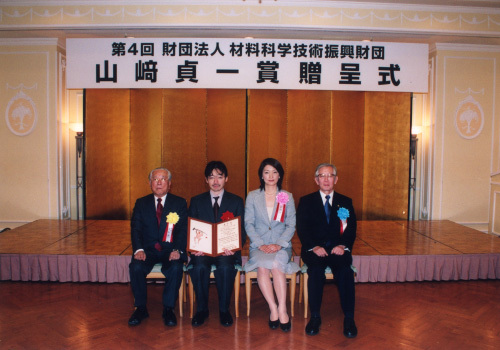 Dr. Atsushi Miyawaki succeeded in developing the world's brightest GFP variant. Not only did this make bioimaging with little labeling possible, cDNA clones of over 20 new fluorescent proteins were obtained as well. In addition, he succeeded in advancing GFP technology to develop a Ca2+ indicator, which led to success in analyzing Ca2+ behavior in regions of cells and subcellular domains that could not be assessed conventionally. Of note is the protein Kaede that he obtained from a stony coral (Trachyphyllia geoffroyi) that he purchased from a pet shop: this molecule changes from green to red when irradiated with (ultra-) violet light. Using this property, he marked specific cells in a complex population. He thus became the first person in the world to succeed in tracking the behavior of those cells or reddened protein molecules inside live cells. At present, this optical marking technology is used primarily in the fields of embryology, regenerative medicine and neuroscience for research on cell lineages, large-scale cell position changes, cell transfer, functional networks, morphology and the like, and is garnering widespread interest. At present, Dr. Miyawaki is actively engaged in the continued development of bioimaging technology. Examples of his work include quantitative FRET measurement methods, the development of simultaneous dual wavelength excitation illuminators for the advancement of multicolor imaging, devices that introduce DNAs into cells using nanotechnology, and technology for introducing mutations for in vitro gene evolution. These technologies are garnering attention and being applied not only in the fields of basic life science and medical science but also extensively throughout the biotechnology industry, beginning with the drug discovery industry. For his efforts in the original research of bioimaging technology and the development of applied technology that has produced a substantially pervasive effect, Dr. Miyawaki has been selected as this year's awardee. In 1962 (around the time awardee Dr. Miyawaki was born), Dr. Osamu Shimomura discovered and purified the green fluorescent protein (GFP) from the jellyfish Aequorea victoria. In 1992, the jellyfish GFP gene was cloned, causing a revolution in fluorescence labeling technology in cell biology. The use of genetic engineering techniques has enabled the fluorescence labeling of cells, subcellular organelles and biomolecules. In 1999, new fluorescent proteins were cloned from coral animals. At the turn of the century, the genome structures of various life forms were elucidated, with players in cellular function (biomolecules) gathering together. In keeping with the above circumstances, biology is now said to have entered the post-genome era. With the growing demand for visualization techniques to understand how biomolecules behave in live cells, expectations are high for innovations in fluorescence imaging technology and the spread of such technology. The dynamic behavior of biomolecules is crucial to understanding the mechanisms of cell proliferation, differentiation, and canceration, and the field itself has attracted the attention of the pharmaceutical industry, in particular. Since his student days, Dr. Miyawaki has devoted his attention to fluorescence resonance energy transfer (FRET) as a type of post-genome technology. Inspired by the cloning of the GFP gene in 1992, Dr. Miyawaki presented his thesis on the application of FRET technology using GFP in 1997. The realization of GFP variants that serve as donors and acceptors and are fused to proteins that demonstrate structural changes in the presence of Ca2+ led to the development of cameleon, a true-protein Ca2+ indicator. The achievement of FRET via genetic engineering resulted in the first presentation of a research mode for visualizing molecular interactions and structural changes occurring inside live cells. Ca2+ concentration displays specific spatiotemporal patterns upon external stimulation. Although Ca2+ imaging has been popular since around 1985, the indicators used were synthetic compounds or luminescent proteins and thus, there were limitations in the type of cell that could be analyzed and the method that could be employed. The emergence of cameleon made it possible to measure Ca2+ concentration at specific positions in specific live plant and animal cells. In addition, by applying the circular permutation variant technique to GFP, Dr. Miyawaki's group invented pericam, another true-protein Ca2+ indicator. Today, cameleon and pericam are being used by researchers worldwide and are contributing substantially to the growing understanding of Ca2+ dynamics and homeostasis in living organisms. In the drug discovery industry as well, they are used as tools for analyzing the interactions of G-protein-coupled receptors with ligands. In addition, his group has developed a bright version of GFP, "Venus," which is now being used by many researchers all over the world. Venus has enabled fluorescence labeling that was impossible previously. Seeking new fluorescent proteins, Dr. Miyawaki and his colleagues have conducted cloning from a variety of life forms (mainly the cnidarians; commericila application has commenced since 2003) with two aims in mind. The first aim is to disseminate fluorescent proteins and the fluorescence imaging techniques based on them to the industrial world. Patents for the use of jellyfish GFP have been filed in the U.S., of which the licensing fees are extremely high. Thus, even major Japanese manufacturing companies have refrained from acquiring licenses from them. To this end, his group has provided domestically made fluorescent proteins in an easy-to-use form. Their second aim is to elucidate the various physical properties of fluorescence from cloned fluorescent proteins and develop a new modality of imaging technology. Since 2002, they have incorporated "light-operated technologies" in fluorescence imaging. First, Kaede, a fluorescent protein that changes its color from green to red under ultraviolet light, was announced by his group. Technology that employs light for labeling cells, subcellular organelles, and biomolecules has been established. For example, it has enabled neurons, which are intertwined in complex ways, to be stained with different colors while in their viable state. This technology is expected to serve as a vital tool for elucidating the behavior of stem cells and their daughter cells in regenerative medicine. In 2004, Dronpa -- a photochromic fluorescent protein that is able to turn fluorescence on and off by means of light of two different wavelengths -- was announced and rewritable molecular memory technology was created. In terms of their application to cell biology, the dynamic aspects of biomolecular behavior have been delved into. To enable the practical application of technology based on fluorescent proteins, similar to that described above, the development of optical systems, including microscopes, is imperative. Color CCD cameras (jointly developed and commercialized with Hamamatsu Photonics K. K.) for high-speed observation with quantitative FRET and illumination systems that utilize digital micro mirrors have been developed. The pursuit of the physical properties of fluorescence, namely, intensity, wavelength (color), polarization, lifetime, quenching, energy transfer, photobleaching, photoactivation, photochromism, etc., will naturally involve interdisciplinary research. In addition to physical chemistry and biochemistry pertaining to fluorescent proteins, Dr. Miyawaki has endeavored to expand his research to include also approaches from optics and engineering. The fluorescence imaging technology that has been developed is expected to serve as a powerful tool for drug screening in the drug discovery industry. Applications to optical memories, optical switches, displays and the like are also conceivable. Genetically coded, biodegradable fluorescent proteins are replete with possibilities in terms of developing new technologies for material science.